Getting obd2 emishion legal - General Discussion - Drive On Wood! well I just received a newer pcm that can be tuned and will be doing the swap soon this should allow me to reconfigure the emishions . no more reset everything to pass . so I will post results and if all goes well I will offer my services to any one looking to go obd2 96 and newer . 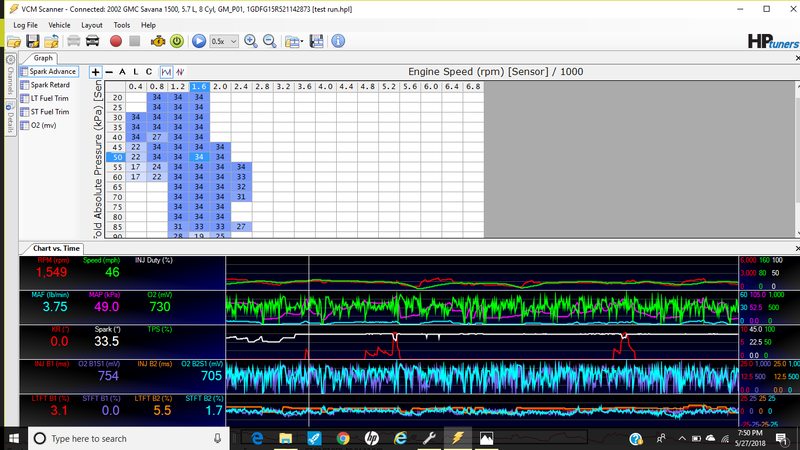 when I have the equipment should be tomorrow I can list all of the vehicles I will be able to tune . Good luck on your learning experiance, hopefully you can mod the timeing more advanced for power when on open road conditions, very interesting, keep us posted. And i allways wanted too learn more addvanced auto computor programing, i paid over 10 grand for auto repair class at baker college and had too pay more than that for computor systems 2 class, i passed the ase test back in 03 for auto electric and computors 1 test.Though i never took the ase advanced computor tech test. We never did any advance diagostic shop work just the book test.college scams dam shame. Best too just read the books and the buy the equipment needed too work with in the first place. Of coarse it was a nafta grant for school or i would have jumped ship sooner, once you sign up for the school and start classes you wete not alould too change coarse. This tuneable PCM, would this be for GM, Ford, or Chrysler/Dodge/Jeep systems? Even within the same manufacturer there are years changes in harnessing/communications protocols/terminals pinning in the ever changing OBDII needs-to-satisfy requirements. So does this direct harness plug-in replace an original factory specific PCM? Or an piggy-backed harness Y’ed in over-rider type? Or an all-the-same mandated OBDII diagnostic plug-in modifier type? hi steve the pcm is for my 96 gmc with the 5.7 l the stock pcm is not tuner friendly. I’m installing a 2000chevy express van pcm the van runs the same engine but a better faster pcm but I do half to repin the main harness…others shouldn’t half to do this only 96-99 chevy . tunercat makes a system to do this but it will only work for 96-99 gm trucks I couldn’t see paying for only 3 year capable system . I went with hp tuners this can do almost any vehicle I come across . look up hp tuners kevin its a powerfull system that is used for engine swaps or mods like turbos blowers headers any thing you can think of . all can be changed to the point one could mess things up there is plenty of warnings . that looks like the hardest part learning the system. I’ve asked this of others and gotten no response. Scroll down past FORD for RAM/Dodge/Chrysler/Jeep. Hey! Even Mercedes trucks/vans. I will be following your progress closely Paul. My truck is so close now. If I could only have time and money at the same time. Good luck with the projects Trucks and tunners. well I have had a few days playing with this system not on my truck yet but the daily driver it does all as advertised and more than I probably should be allowed to do . when I get my pcm changed out the wood burner game on by then I should have a pretty good grasp on things . now just trying to figure how to calibrate for dual fuels if possible . new pcm installed and re pined after a reflash fired right up few now when the road clears it will be time to start logging data and trying to make the computer work for rather than against . 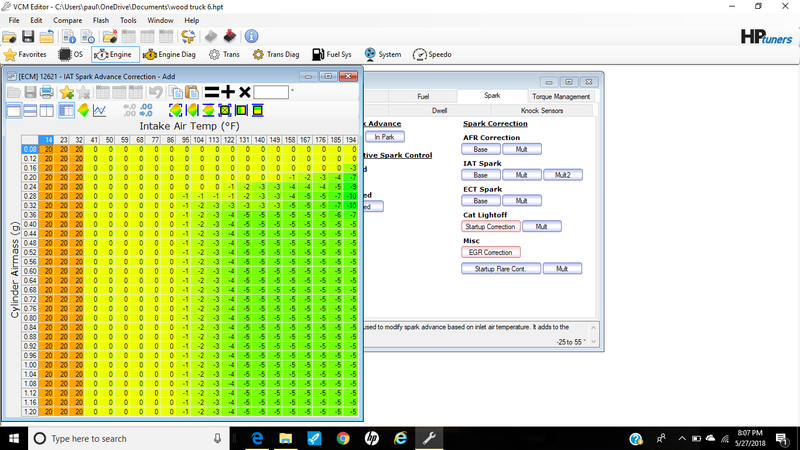 I was able to remove all cam crank codes evap maf and egr related codes inspection should be a breeze this year. 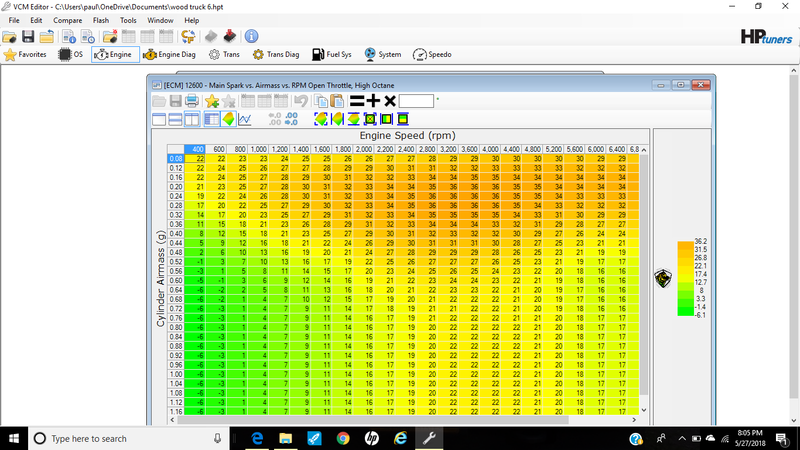 now looking at all the spark tables to see if I can set up the charts to know when wood is the fuel of choice. if anyone is looking at obd2 and lives in a inspection state I could offer at least the code delete for just the cost of the credits to get control of the computer this is generaly 100. bucks and this is only for wood / charcoal builds. steve was nice to post a link above to the site if you want to see if your vehicle can be tuned or post here and I can look it up. on a side note unless you have a 96-98 gm truck no pcm change will be needed. they are the oddball . I’m not sure what your asking tom the re pin I had to do because my original pcm had 5 smaller plugs with 20-30 wires in each the new pcm has 2 large plugs all the wires had to be installed into the new plugs. ok I know what your talking about you might be able to find one in a u pull it yard if you know what configuration your looking for . I forget what year truck you have maybe I have one here there small I’m sure it wouldn’t cost much to ship . I will look for the video you are talking about and see what could be done. its been a couple but work got very busy just went through inspection all good to go had some time to do some road testing on petro only . the first table it the main spark the second is where I’m getting my advance from I have a switch on the air temp sensor when on gas it follows the factory timing . when I flick the switch the temp goes to -38 and the first 3 rows I have set it to add 20 degrees here is a couple of screen shots of this. after switched there was some knock retard in this one I will try wood next. 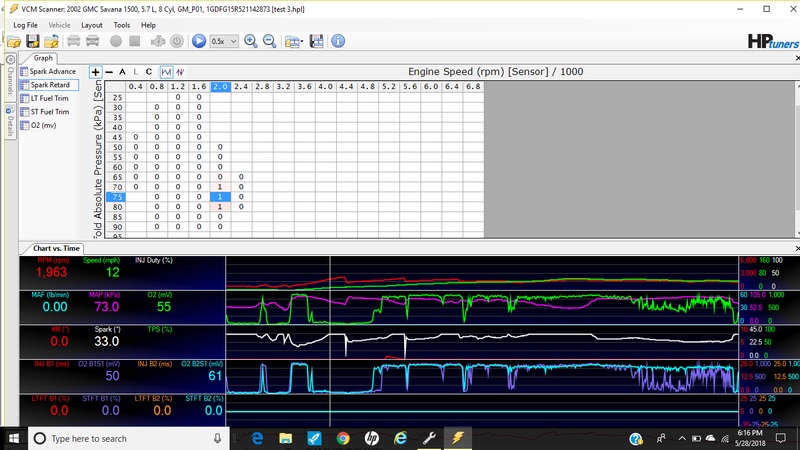 I got a few runs on wood today and had some spark retard showing so I guess I have room to lower timing here is a screen shot around 1900 rpm just before first to second and the same with second to third that shift you can see some knock being picked up. Nice job paul monitoring the obd 11. Hope you can pick up a little extra power with just useing timeing controll with your experimenting trials, Thanks keep us posted. once I have a good timing map I will wire it so when I cut fuel it will automatically switch to wood timing so no forgetting going between the two. and one less control to be hooked up . and now I don’t have to pull the distributer and reset timing to stock just to pass inspection then pull and reset again for the rest of the year. That’s neat. I wish I had the knowlidge (and interest) to play with mapping. My Mazda dist is a heavy piece of metal, also horisontal, so I decided to go without a cable. I advanced it as much as the slots allowed at a fixed setting and that’s it. Occational kick-back cranking up on gasoline. Running woodgas with the Rabbit I couldn’t tell any difference in power advanced or retard. I get the feeling the Mazda behaves about the same. 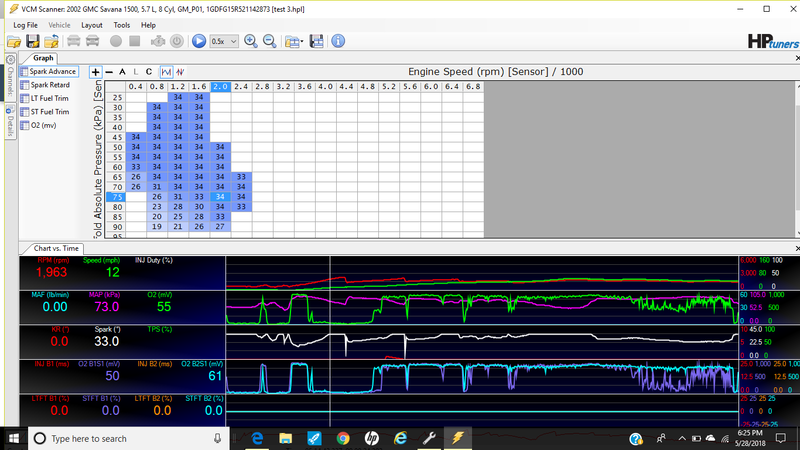 For some reason 4 cyl OHC engines don’t seem to mind the timing as much. I wonder why that is.